Установлен Exchange 2013. Нужно сделать переход на 2019. Exchange развернут по докам. 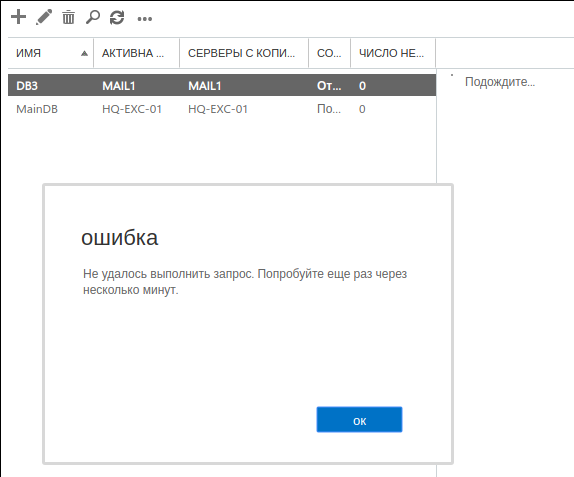 При создании базы в Exchange 2013 в каталоге база создается каталог вида AB5C9F85-F705-4F01-9267-0EF77CE83F4B12.13.Single с индексом и прочей метаинфой. На сервере Exchange 2019 такой каталог не создается. В ecp это также вызывает ошибку "Не удалось выполнить запрос. Попробуйте еще раз через несколько минут." и не отображает сведения по базе. The search engine previously used in Exchange Server was based on the FAST engine and has given many Exchange administrators sleepless nights. The Exchange Team’s blog post announced the integration of a new search engine based on "Bing Technology". First, it's good to finally get rid of the FAST search and no longer worry about corrupt search indices, but secondly, some readers will certainly cringe at the term "Bing". The Bing search engine available on the web has a very different perception of the quality of the search results, especially when used in non-English countries. However, in the context of Exchange Server 2019, the focus is less on the word "Bing" but on the term "Bing Technology". The key advantage of the new search is that the storage of metadata and indexes is no longer stored in a separate folder structure in the file system of each server, but in the mailbox database. The information is kept synchronized using the native and robust log-shipping mechanisms. This technological trick allows an even faster activation of a passive database copy in the case of a switchover or failover. By storing the search information in the database it’s automatically part of a backup.